Comfortable 1 Bedroom, 1 Bathroom. Sleeps four. Enjoy your private island paradise on Lover's Key! Our condo is directly on the beach and has a beautiful ocean view. Our newly remodeled condo has a modern coastal décor, a bedroom with a king size bed, plus a sofa bed in the living room. New wood-look porcelin tile floors, granite countertops and modern amenities along with classic styling create a comfortable beach get-away. It is located directly on a private, white sugar-sand beach with a backdrop of swaying palms, tropical flowers and water fountains. 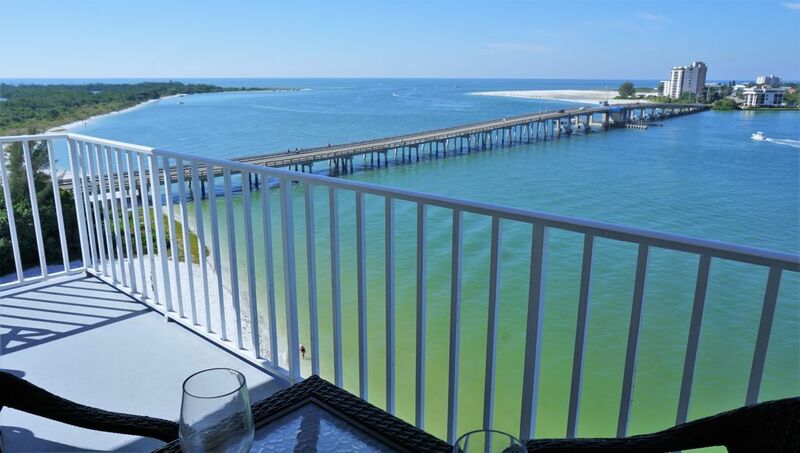 Enjoy the heated swimming pool, hottub, grills and lounge on an uncrowded private beach, with lovely Lovers Key State Park Beach connected right to your private beach for miles of beach walking and shell collecting! There is a full kitchen and dining area as well - conveniences of home in a private beach front paradise! Relax on your private balcony... watch the sailboats pass by, and keep an eye out for the dolphins! You are right across the street from Lover's Key State Park. Explore the beauty of this estuary by kayak or by walking the many trails and miles of gulf-front beach. There are numerous wild-life and bird watching opportunities here. Or take a stroll over the bridge to enjoy over seven miles of Fort Myers Beach on Estero Island. I've tried to think of the 'little things' that matter, so that your stay in our condo will be a memorable one! On-site or Nearby: Private sugar-sand Beach, swimming pool, jacuzzi, kayaking, wave-runners, wind-sailing, shore-fishing, golf, tennis, bike and scooter rentals, theater, deep sea fishing, diving, snorkeling, boating, Everglades Air boat tours, shelling, sailing, sightseeing, shopping, museums, restaurants, bars/ nightclubs, water park, Osteogo Bay Marine Life Museum, Edison's Home, Ford's Home, Minnesota Twins training camp, Boston Red Sox training camp, Key West day trips by boat, Casino Boating and more! There is a trolley that runs up and down Fort Myers Beach and to the Shopping Center (including a grocery store and a K-Mart) in Bonita Springs. The trolley stops right in front of the Condominium - hop on for 75 cents and explore the shops and restaurants of Times Square in North Fort Myers Beach. Or get in a round of golf or a game of tennis - all located within a few miles. I love to travel, exploring new places and meeting new people. My favorite locations are sunny, warm, and near the ocean. I bought our first condo on Lovers Key in 2003, and fell in love with this area. This is my vacation home currently, and my someday retirement home. In opening up my home to guests, I hope to help create treasured memories and welcome my guests back year-after-year. I look forward to assisting you! This location is unlike any others I have traveled to. With the privacy you experience on our private beach yet the access to everything nearby, it truly is a one-of-a-kind paradise. My heart has gone into making my condo welcoming and comfortable and I hope you enjoy it as much as I do! Three outdoor showers for your use after enjoying the pool or beach. Directly on a private beach on Lovers Key - connects directly to Lovers Key State Park beach! Well maintained unit. Beautifully decorated and in a prime location. Have stayed here before and love it. We would like to thank Sandy for sharing this beautiful condo with us which was just as advertised. The condo was clean, updated and the location is awesome with spectacular views. Special thanks to Margaret for the late checkout and Yes we will be staying here again in the future!!! The condo was very clean and had everything we needed. The view from the balcony was wonderful. We spent time watching the boats and beach goers. We even saw a few dolphins. The condo is updated and nicely furnished. We loved walking on the beach in the morning and shell hunting. Definitely a great place to spend Christmas vacation. of dolphins in Big San Carlos Pass. private beach. The large pool is mostly shaded until the afternoon. I love the area and Sandy, the unit was soooo pretty. Very tastefully done. Neighbors all very friendly--would like to stay again. Did not want to leave. The view was awesome and we spent every evening watch beautiful sunsets from the Laguna. Condo was clean and instructions for entry was straight forward. The beach seemed almost private very few folks used it in the week we were there. Directly on the beach on Lovers Key at the south end of Fort Myers Beach just north of Bonita Beach. Relax in the large heated swimming pool and hot tub, which overlook the bay. Grill up your freshly caught dinner on the gas BBQ, and enjoy dining next to the water on our 'dolphin deck.' Have a blast on the wave-runners (jet skis), power boats, sail boats or the pontoon. These rentals are all available nearby and are a fun way for your whole group to go out and enjoy the water and see the dolphins, sting-ray and sea turtles up close in their natural habitat. Golf: There is a nearby golf course - 1.5 miles from condo - on trolley route.